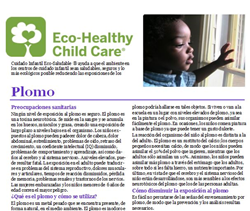 CEHN’s 16 fact sheets on environmental hazards and eco-healthy practices for child care facilities, part of its Eco-Healthy Child Care® Program, are now available in Spanish. The translation of CEHN’s fact sheets into Spanish is a vital step towards providing more accessible public health and child care resources for a wider diversity of children and their families. The Children’s Environmental Health Network (CEHN) is a nonprofit organization with the mission to protect the developing child from environmental health hazards and promote a healthier environment. Since 2010 CEHN has managed and expanded the Eco-Healthy Child Care Program® (EHCC) as one of its core initiatives. EHCC provides training, technical assistance and resources to child care professionals on how to create child care settings that are as environmentally healthy as possible. The program offers an endorsement to child care facilities that comply with 24 of 30 best practices, and highlights these facilities for parents nationwide. A core EHCC resource is a set of 16 fact sheets centered on environmental health hazards commonly found in child care settings, including: lead, mercury, household chemicals, unsafe plastics, radon, and pesticides. These fact sheets include tips on free to low-cost methods to reduce children’s exposure to these toxicants. All 16 fact sheets have been translated into Spanish and are available for free download on the CEHN website. The number of Spanish speakers in the U.S. has grown rapidly in recent decades, and the Pew Research Center notes that Spanish is by far the most spoken non-English language in the country. There are very few Spanish language resources available on environmental health hazards affecting children in the home or child care setting. CEHN strives to address this void with the addition of these translated EHCC fact sheets. Dr. Cynthia Bearer, CEHN Board chair, notes that “The translation of CEHN’s factsheets into Spanish is a vital step towards providing more accessible public health and child care resources for a wider diversity of children and their families.” Other CEHN resources offered in Spanish include the checklist for the EHCC endorsement program and the Childhood Leukemia fact sheet, both of which are available for free download.